Washington Post columnist Alexandra Petri has posted her insightful and very funny list/ranking of 100 Christmas songs. With two exceptions (71 and 2), none of her choices are in my collection, to which these fine musical works are being added this year. All of them should available in your favorite digital store or streaming service. So listen and enjoy. 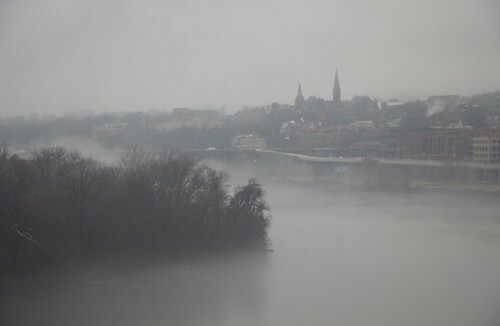 Photo is of Georgetown as seen from Kennedy Center on the foggy Christmas eve of 2014, and posted to my Flickr account. I have great hopes for Flickr under it’s new, non-corporate owners in the new year. This is my idea of an annual tradition: a collection of the holiday-related songs I can stand to have on heavy rotation over the next month or so. As opposed to the traditional playlist of earworms that even the programmers at Muzak must be embarrassed to let loose on the world. But regardless of your musical tastes, and whatever you are celebrating this time of year, enjoy! Randy Newman has release a new collection of his songs, the first in almost a decade, and it is wonderful. The first “album” I’ve bought in many years. He recently performed four of the tracks for NPR’s Tiny Desk Concert and it’s a great showcase of Newman’s talent as both a song writer and performer. Although the song “Putin” is the one that seems to be getting lots of attention, my favorite, both in this performance and the album, is “It’s a Jungle Out There”. Newman has taken his fun, character-appropriate theme from the TV show “Monk” and turned it into an also fun but very satirical reflection on the paranoia (possibly justified) of modern life. I could be wrong now… but I don’t think so.